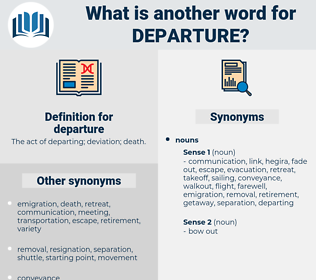 What is another word for departure? The act of departing; deviation; death. withdrawal, retreat, evacuation, disappearance, takeoff. 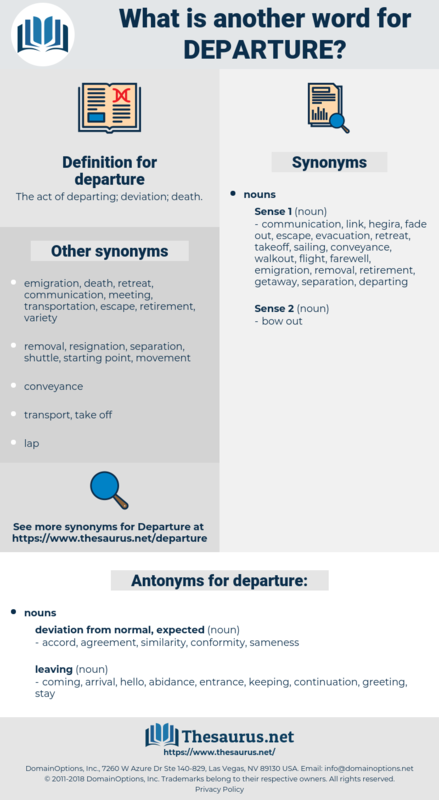 dive, beginning, pullout, take-off, expulsion, deportation, demise, disembarkation, commencement, breakup, discontinuation, lift-off, emigration, farewell, springboard, depositioning, consignment, travel, disengagement, exception, remoteness, liftoff, leaving, break-up, destination, Quitting, attrition, arrival, failure, non-completion, discontinuance, shift, absence, basis. travelled, Emigrated, Stayed, Proceeded, Sailed. measured, disposed, discharged, checked, gone. outset, abandonment, rupture, derogation, starting-point, exodus, estrangement, diversion, aberration, deflection, inception, desertion, detour, digression, entry, out-migration, exit, relinquishment, flight. accord, agreement, similarity, conformity, sameness. coming, arrival, hello, abidance, entrance, keeping, continuation, greeting, stay. The subject concerned his departure, and he asked Rose if she should be sorry. I returned home on the third day after his departure. leave, embarkment, disappearance, disappearing, embarkation, leave-taking, despatch, French Leave, dispatch, parting, sailing, shipment, exit, farewell, takeoff, breaking away, withdrawal, boarding. deed, human activity, act, human action.